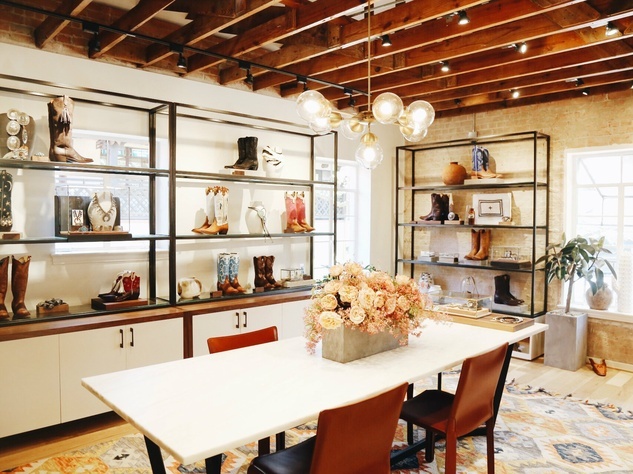 Sisters Sarah Means and Lizzie Means Duplantis are putting a luxe spin on Western wear with the launch of their new boutique, Miron Crosby. The 490-square-foot shop is located above the Honor Bar and is the brand’s flagship and first brick-and-mortar store. It houses a stock of boot options for men, women, and children in addition to bespoke services. Inspired by the sisters’ upbringing on a West Texas cattle ranch, Miron Crosby boots are artisan-made by Rios of Mercedes, a 160-year-old manufacturer owned by the sisters’ cousins. Boots are crafted with fine leather and exotic skins and are intricately stitched. Offering a sort of concierge service, Miron Crosby allows customers to create a one-of-a-kind pair by modifying existing silhouettes with various materials and colors. For something truly special, monograms can be added and handwritten messages can be sewn to the boot’s lining. The line’s inaugural collection features a trio of silhouettes — the iconic tall cowboy boot, the ubiquitous shorty, and the more contemporary midi boot —with design elements evoking the Chihuahuan desert, Native American tribal art, and Frank Lloyd Wright’s Prairie School architecture. For those who aren’t in the market for boots, the store also boasts a curation of jewelry, belts, barware, and home accessories sourced from across the country.